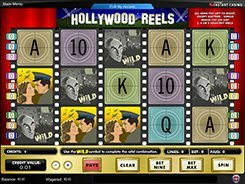 Hollywood Reels is a movie-themed video slot with 5 reels and 9 fixed paylines. On the reels you will come across playing card icons from 10 to A, a clapperboard, a Walk of Fame star, shots from classic movies and other themed icons. 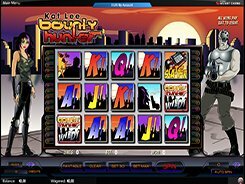 By adjusting a credit value from $0.01 to $5, and the number of credits per line (up to 5), you may place a bet anywhere between $0.09 and $225 per spin. To increase the number of credits on each of the nine lines, you need to press the Bet Nine button that is commonly found in Amaya’s video slots. The vampire from an iconic 1922 Nosferatu movie is a wild that replaces for regular symbols, except 10-A symbols, to complete winning combinations. Besides, the wild pays out the largest jackpot of 2500 coins, for five of a kind. A wonderful Film Pick feature is activated if you collect 3+ Clapperboards on adjacent reels. In the bonus round played on the second screen you are to click film cans to reveal bonus multipliers until the “Collect” word is revealed that ends the feature. The more multipliers you get, the greater your bonus award will be. PLAY FOR REAL MONEY!